How Does Anxiety Cause Stomach Problems? Bowel obstructions can be painful and occur when a blockage prevents intestinal contents from properly passing through the digestive tract. These blockages can occur in a variety of places, including in either the small bowel (small intestine) or large bowel (large intestine or colon) in addition to either internally or externally from the intestine itself. Whether a bowel obstruction is a total or partial obstruction depends on whether any intestinal contents are able to pass by the obstructed area or the blockage prevents any contents from passing. Within the small and large intestines, there are several medical problems that may lead to a partial bowel obstruction and cause related symptoms. 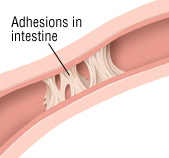 Adhesions are made up of a type of scar, formed by areas of fibrous, tough connective tissue. They account for 50-70 percent of all small bowel obstruction cases in the United States, making them the number one cause. The motion of the intestine makes it common for the scar tissue collections – or adhesions – to, over time, stretch into stringy or band-like ethers. Because of the gradual progression, adhesions do not always generate symptoms early on. 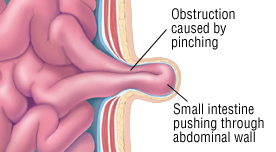 Adhesions can cause obstructions within the small bowel if they form into a constricting band shape – this can pinch part of the small intestine closed from outside of the intestine. Their gradually growing nature can also allow adhesions to bind to nearby loops of intestine, constricting over time until it eventually contorts the intestine, limiting the flow of intestinal material. Adhesions typically develop outside of injured pelvic or intestinal areas while they heal post-surgery or infection. Of note, adhesions are most likely to occur following surgeries that involve the appendix or colon or surgeries that are gynecological in nature. Hernias are a protruding portion of the small intestine that are visible from outside the body, a result of a structural weakness within the abdominal wall’s muscles and fibers. Hernias are the number two cause of small bowel obstructions in the United States and account for approximately 25 percent of all bowel obstruction cases each year. Hernias can work as a symptom of a future bowel obstruction, as the portion that pokes through the abdominal wall can get trapped or pinched, restricting movement within the small intestine. In extreme cases, if the intestine is pinched, it can completely cut off blood supply. Hernias typically first manifest as lumps near the navel, between the breastbone and navel, near the groin, at the front of the upper thigh, or at a healed surgical incision site. Small bowel obstructions can be caused by a cancerous tumor pinching the bowel closed via pressing on the outside of it, or caused by slowly blocking a bowel’s inner passageway by growing within the intestinal wall. Cancers cause only a small percentage of all small-bowel obstructions – more typically, it is a cancer that has spread from another site to the small bowel, rather than having begun in the small intestine. 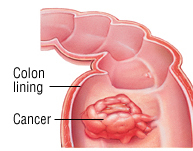 Colorectal cancer is responsible for nearly 50 percent of all large bowel obstructions. If colon or rectal cancer is left undiagnosed, it can gradually narrow the intestine’s inner passages. Before the passage becomes fully obstructed, patients usually experience intermittent constipation. 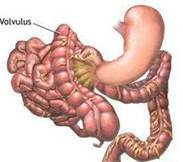 Volvulus occurs when a portion of the bowel twits around itself, producing a closed bowel loop with a pinched base; this pinch leads to the bowel obstruction. In Western countries, volvulus is most common in patients 65 years of age or older who have a history of chronic constipation. 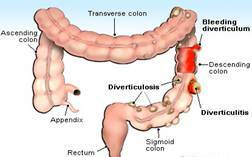 Diverticula are small, balloon-like pouches that protrude from the intestinal wall; infection of the diverticula is known as diverticulitis. As the infection heals, scars may form in the intestinal wall – at times encircling the colon to form colon strictures. As strictures age and tighten, they may gradually block the colon by tightening. There are many other causes of partial bowel obstructions in the large intestine, such as abdominal or pelvic surgeries, muscle and nerve disorders, infections, and side effects of various medications. As with most illnesses, there are several symptoms of a partial bowel obstruction, including abdominal pain, nausea and vomiting, and constipation or diarrhea. Abdominal Signs. As intestinal contents begin to build up, they can cause painful cramping, as well as distention or bloating. Following food intake, large amounts of gas may occur. A very firm or rigid abdomen not due to extreme muscles is also a symptom. Vomiting and Nausea. When food isn’t moving properly through the intestine, it causes a decrease in appetite. Patients with bowel obstructions may feel full after eating very little or experience nausea due to undigested foods remaining in the intestines accompanied by gas. Vomiting may indicate a worsening obstruction and is largely dependent upon the severity of the blockage and amount and type of food consumed. Diarrhea and Constipation. Prolonged constipation and diarrhea can be partial bowel obstruction symptoms; however, food can affect either of these. Your doctor may recommend a special low-fiber diet that is easier for your partially blocked intestine to process or utilize a “wait and see” approach. Partial bowel obstruction resolution commonly results in hospitalization. If hospitalized, you will not be allowed to eat or drink and will instead receive fluids intravenously. A flexible, lubricated nasogastric tube (NG tube) will help to relieve excess gas from your intestines and stomach via nasal insertion. The obstruction should improve within a few days, at which point you can start to regularly consume small amounts of liquids and solids. In severe cases of complete instruction, surgery is necessary to remove the cause or repair or remove the damaged portion of the intestine. CopyRight © WWW.MED-HEALTH.NET. Last Updated 18 April, 2019.